A court transcript has provided the clearest picture of the ongoing international investigation into OneCoin yet. The transcript in question is that of Mark Scott’s bond appearance on September 13th, 2018. Scott (right, with wife) was indicted in August 2018, on charges relating to his laundering of over $400 million in stolen Onecoin investor funds. Although the hearing was a months ago, the transcript has only recently been made public. Representing US regulators at the hearing were a DOJ attorney for the Southern District of New York, two federal prosecutors and an FBI agent. When asked for details about the case early into the hearing, one of the federal prosecutors described OneCoin as “a fraudulent cryptocurrency”. This fraud scheme was international in scope and brought in approximately $4 billion worldwide from victims. Can I just ask a question about that. Is that cryptocurrency fraud scheme in the nature of a pump and dump or Ponzi, or do you know? The answer to the court’s question confirmed what has been known about OneCoin for some time. It is (a) hybrid Ponzi pyramid scheme. It is a fraudulent cryptocurrency that does not have, as far as the investigation has determined, a true blockchain, and most investors have not been able to recoup or take their money out of the scheme once they invest in these coins. There is some degree of Ponzi scheme here simply because there are commissions paid to promoters and recruiters in order to bring in more victims. OneCoin’s blockchain controversy began in early 2017, following a report the company was using a SQL database to track affiliate investment. OneCoin has denied the claims, going so far as to claim investigations in Germany certified the company has a blockchain. To date no evidence or reference to any specific investigation has surfaced. Yet that hasn’t stopped OneCoin’s investors from incessantly parroting OneCoin’s claims. While the above example from OneCoin investor Igor Krnic is somewhat dated, the most recent instance I can provide you is barely 24 hours old. – Onecoin has a real operating Blockchain and therefor is a real cryptocurrency. The author of the article Ted Nuyten, CEO and owner of BusinessForHome, is believed to have received undisclosed sums of money in exchange for favorable OneCoin coverage. Nuyten has also personally appeared in OneCoin promotional material. The investigation the US federal prosecutor is referring to is believed to be an ongoing joint international effort. 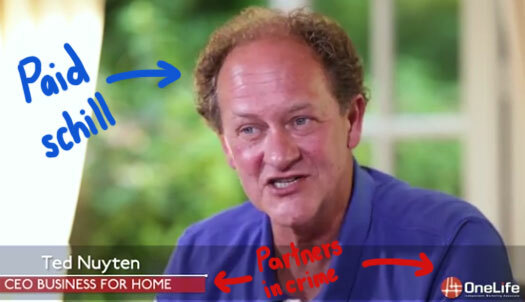 role in this scheme was he’s a licensed attorney, and he joined the co-conspirators and formed hedge funds, international hedge funds, with accounts in the Cayman Islands as well as Ireland. And through those hedge funds, he laundered the proceeds of the cryptocurrency fraud scheme. In order to do that, he lied to banks, he lied to fund administrators, and he misrepresented where the funds were coming from. were coming into the hedge funds … from a select group of European families and entities that were investing who (Scott) had known for many years. revealed that the money that was coming into the hedge funds that (Scott) formed were solely the proceeds of this fraud scheme. $15.5 million in fees … used … to buy beachfront property, luxury vehicles, luxury watches. voluminous discovery materials, which include both hard copies and voluminous electronic evidence. Those categories are broadly defined as bank and financial records, emails, fund administration records, pen register records, phone records, WhatsApp and email account records, GPS records, the cryptocurrency promotional materials, and the cryptocurrency account materials. We have real estate records, corporate entity organization records. We have photos of a phone of his and information on that phone. We have FBARs that (Scott) filed with the IRS this past summer. We have a list of accounts that were seized or restrained. We opened an undercover account in the cryptocurrency scheme, and so we have materials from that. Key to apprehending OneCoin founder Ruja Ignatova (right) and her co-conspirators, are communications between them and Scott. This is evidence that was seized as part of Scott’s arrest warrant. Unfortunately analysis of that evidence has been delayed, on account of Scott representing to at least one co-conspirators that he was acting as their attorney. This has resulted in potential client attorney privilege, requiring the use of a privilege review team. For that reason, the investigative team does not have all of the materials that are now in the possession of the privilege review team. Once the priviledge review team has finished sifting through it, US regulators will have access to Scott’s OneCoin data on ‘at least 17 phones, six laptops, two iPads and three memory cards and five flash drives‘. Bear in mind that this was as of October 2018. Since then there have been no public updates regarding the ongoing OneCoin investigation. Ruja Ignatova’s second in command, Sebastian Greenwood, was arrested in Thailand and extradited to the US sometime during the 2018 4th quarter. Other than confirmation of the arrest via Thai authorities, US authorities have yet to release anything public regarding Greenwood’s current status or whereabouts. Ruja Ignatova’s whereabouts weren’t discussed at the hearing, however this paragraph might provide a clue as Ignatova’s disappearance since mid 2017. The investigation has revealed that one of the co-conspirators most likely has fled to a jurisdiction where there is no extradition treaty with the United States. As for Mark Scott, US authorities have revealed he has German dual citizenship. Owing to Scott’s “significant foreign ties”, they see him as a flight risk. no combination of bail conditions will assure his return and appearance in court. Nonetheless Scott was released on a $2.5 million bond later that month. BehindMLM continues to track Scott’s case but, as of January 23rd, 2019, there are no further updates on Scott’s case docket.